Project Adventure is one of Jeff Lake Day Camp’s most popular activities for campers of all ages! Our progressive facilities and certified instructors give campers the opportunity to experience non-stop fun that is both safe and appropriate for their age and skill level! Jeff Lake’s youngest campers are challenged at Adventure Town. Specifically designed to be developmentally appropriate for pre-K through second grade, this four-sided obstacle course challenges balance and coordination and offers campers an experience that readies them for the high ropes elements! 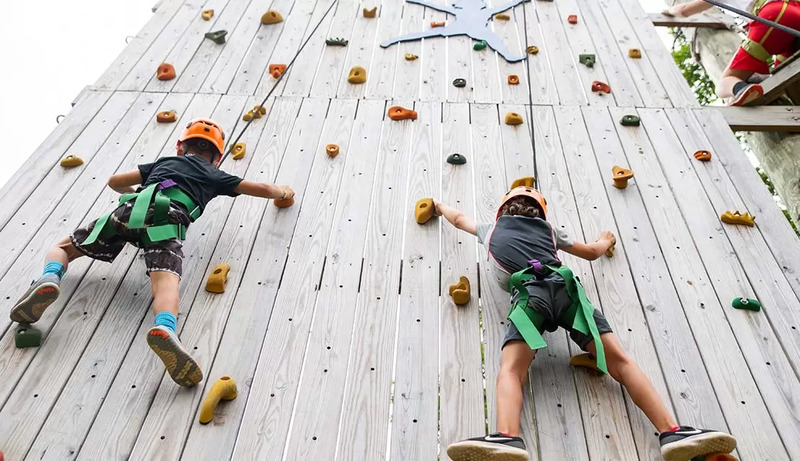 Older campers who are ready to take on a bigger challenge can conquer their fears on our high ropes adventure course, which includes a climbing wall, zipline, cargo net and much more! Our NEW Aerial Adventure course allows campers of all ages to traverse through the trees without the need of a harness and baley. Once they are inside the course, it is fully enclosed!